This beautiful set of counter stools provides a supportive seat and sleek, low profile, facilitating an unobstructed view of the room or countertop. Also available in white leather. 26" Seat Height (Counter Height). 9 Colours, UK Seller! Fast Dispatch! 2 SHELF POTBOARD FOR SHOES ECT. MADE FROM PINE TO SEAT 2. SEAT HAS A WAXED FINISH. HAND PAINTED MATT WHITE AND WORN BACK TO ADD WARE. Finished off with the original Air Force chevron on the arm and original polished crested buttons rendering a stunning look to this armchair. Depth:- 62.5cm. There are around 50-100 high definition super-sized pictures at the bottom of this page. A really pretty wall mounted Cabinet. It is easy to mount on the wall using the 2 D rings at the back (screws not supplied). This product has a handy shelf ideal for display, 2 drawers and 3 hooks. Painted in Laura Ashley Pale Chambray then Decorated in Peter Rabbit Design. 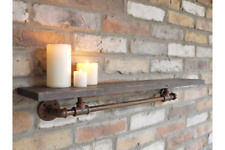 Beautiful Wall Shelf.